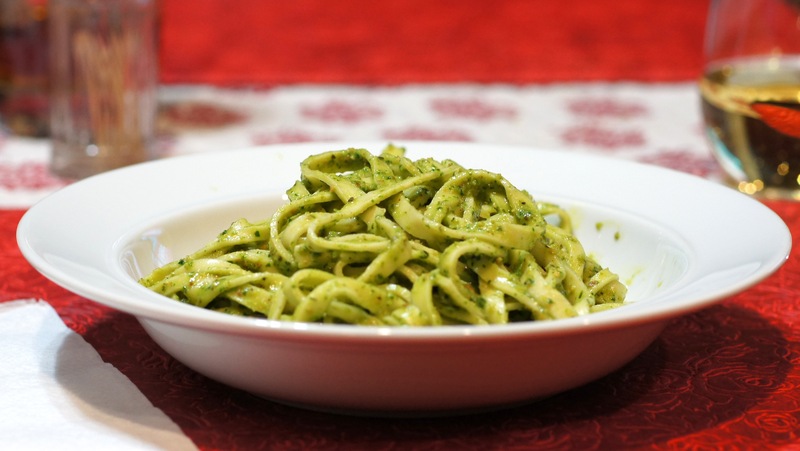 Now that we had made this wonderful Pistachio Pesto, we had to make something to go with it. Inasmuch as my food blogging buddies, ChgoJohn at from the Bartolini kitchens and Stefan at Stefan’s Gourmet Blog post a lot of homemade pasta recipes I decided I needed to make a little fresh pasta. So, homemade pasta with pistachio pesto it was. It has been years since I have made fresh pasta. Now, I have never made the likes of the fresh pasta made by Stefan or ChgoJohn. 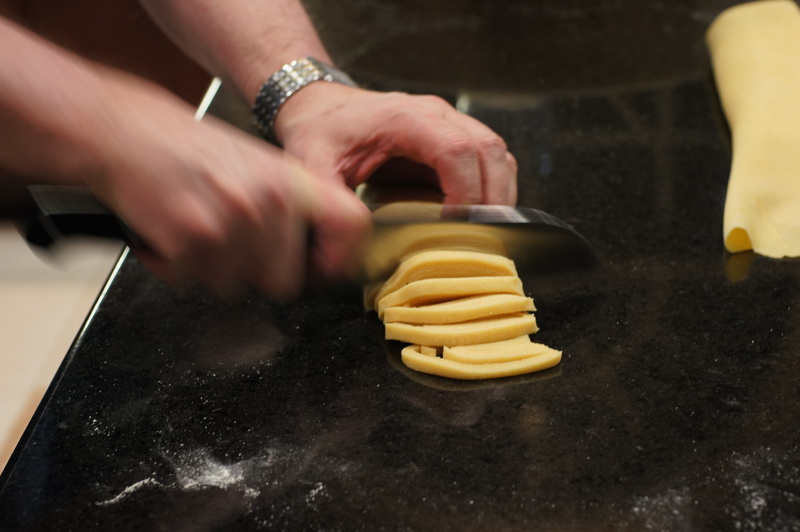 These guys are making fabulous ravioli, orecchiette, cappelletti, pappardelle, tortellini etc. This list goes on and on. I simply do not have the patience to make the likes of such pasta. 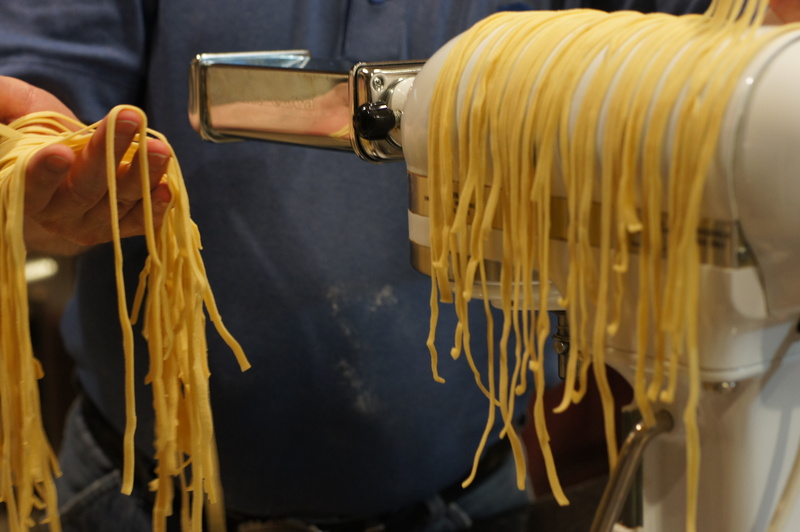 Nevertheless, reading their blogs always makes me want to make fresh pasta. Inasmuch as I knew I would be making this pistachio pasta, we decided fresh pasta would be the way to go. So, we decided we should make homemade pasta. Looking around and liking Lidia Bastianich as much as we do, we borrowed her recipe for basic pasta but used 50% all purpose flour and 50% semolina flour. The net result was a beautifully tender, eggy pasta that went oh so well with the pistachio pesto. I had forgotten how nice homemade pasta can be. This is what we did. 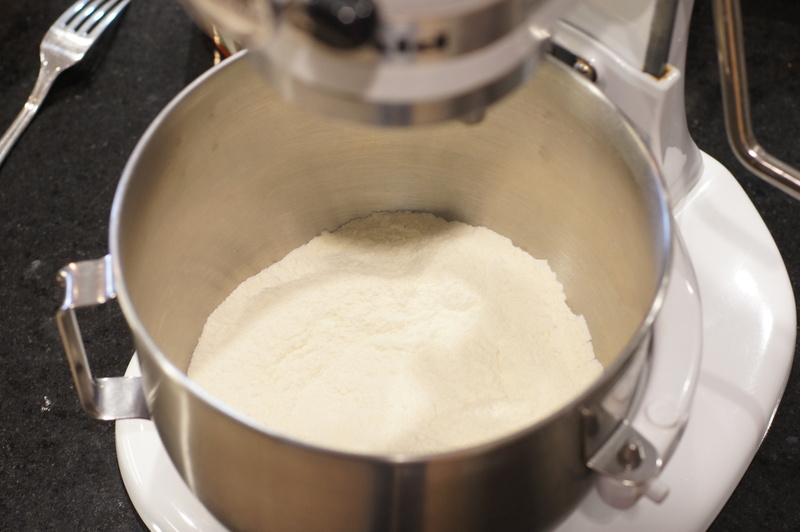 Sift and combine the all purpose flour, semolina flour in a mixing bowl. Remove 1/3 cup for later use. 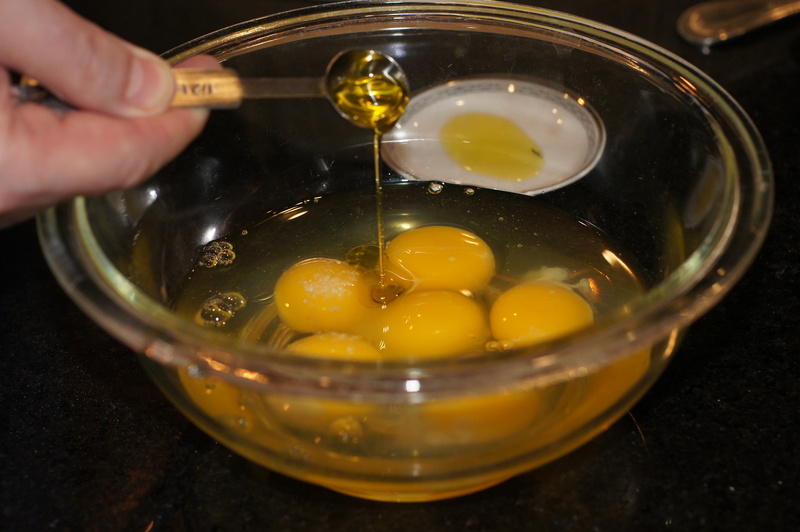 In another bowl add the eggs, salt and olive oil and beat. 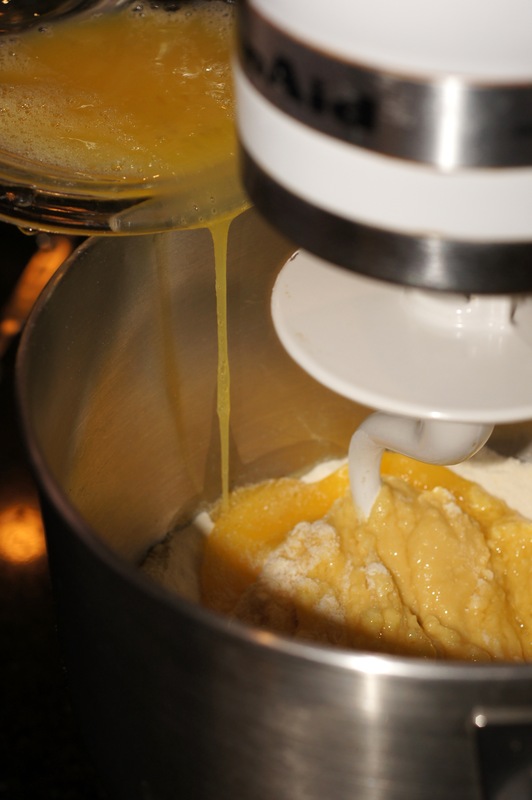 Slowly drizzle the eggs into the flour with the mixer on low. Knead the mixture until it comes together to form a rough dough, adding a little water if necessary. Once a rough dough is formed, pour the flour onto a smooth, floured surface and knead, adding the 1/3 cup reserved flour until a stiff dough is formed. Wrap and place in the refrigerator to rest for 2 hours and up to 24 hours. 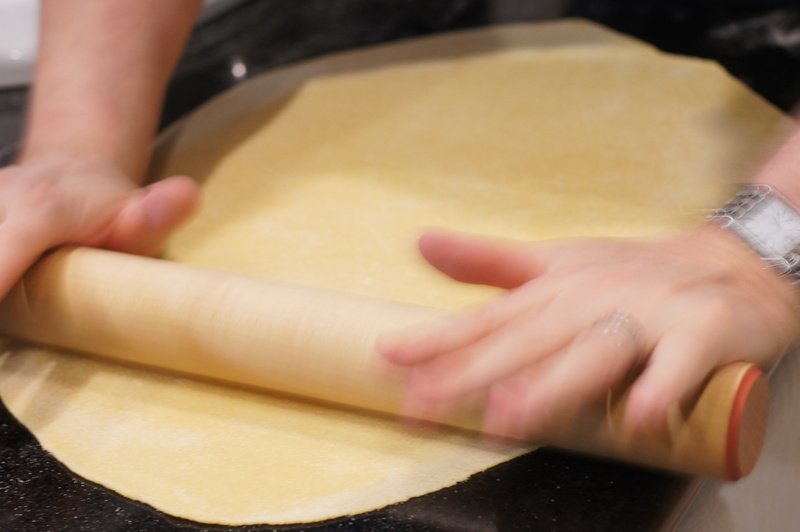 Once the dough has rested, roll the dough out to 1/8 – 1/16 inch thickness. If you have a pasta roller, it’s a lot easier but Knothead gave me a beautiful maple rolling pin for Christmas and I had to use it. After you have reached the 1/8 – 1/16 inch thickness, divide the dough into 6 equal sections. Flour the dough and roll into a cylinder. Using a sharp knife, cut the cylinders into 1/8 inch rounds. Unroll and hang until needed. We didn’t have a pasta hanger but the mixer worked swell. It would have been easier to use the pasta attachment but nothing ventured is nothing gained. 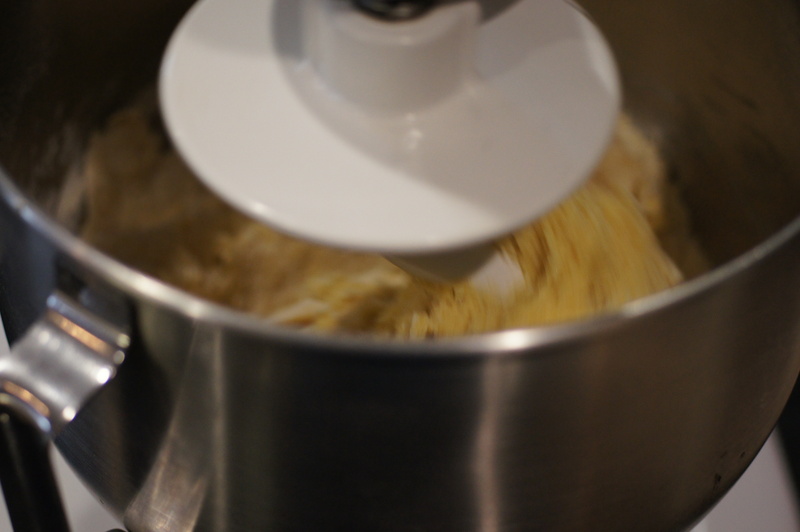 nevertheless, it worked great to hang the pasta when the mixer heard was full. In the interim, bring a pot of heavily salted water to a boil. Add the pasta to the water. Boil for roughly 5 minutes and drain. Mix with 1/4 cup of pistachio pesto and 2 tablespoons of pasta water and toss to incorporate. Serve & enjoy! Makes me want to start making pasta again! Absolutely beautiful! Thanks, Mimi, for you very nice compliment. Next time, however, I will make 1/2 the batch. For 2 of us, 1/2 batch is still a lot of pasta. A beautifully prepared meal…I think everyone will want to get their pasta machine out. Thanks, Karen. It’s a whole lot easier with the machine. I had never done it with a rolling pin and cutting it by hand so this was a new experience for me. I have a hand crank one that belonged to my husband’s mother. It does make it easier but you did a great job without one. Hi, Charu. Thanks for dropping by and your very nice compliment. I did check out your blog and it’s quite nice. I love the flavors of Indian food but cook very little of it. I look forward to reading more of your blog. When I read you pistachio pesto recipe, Richard, my mind was thinking of how great it would be when served with homemade pasta. Something so special shouldn’t be used to dress pasta that may have been on a store shelf for weeks — at least. 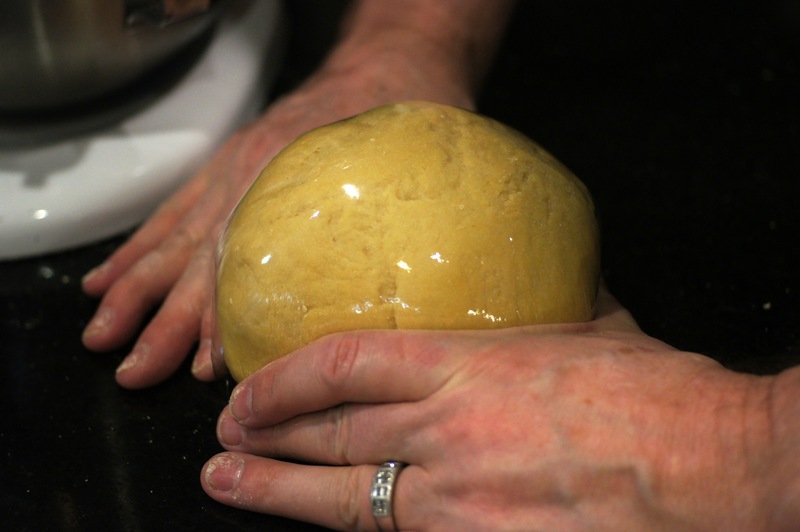 I enjoy seeing the various recipes for pasta dough that everyone uses. I’d like to try yours just to see its “feel.” We’ve only used AP flour and my attempts to use semolina haven’t been too successful. I hope things will change with your recipe. Thanks for today’s lesson and recipe, as well as for the shout out. That was very kind of you and I appreciate it. Hi, John. 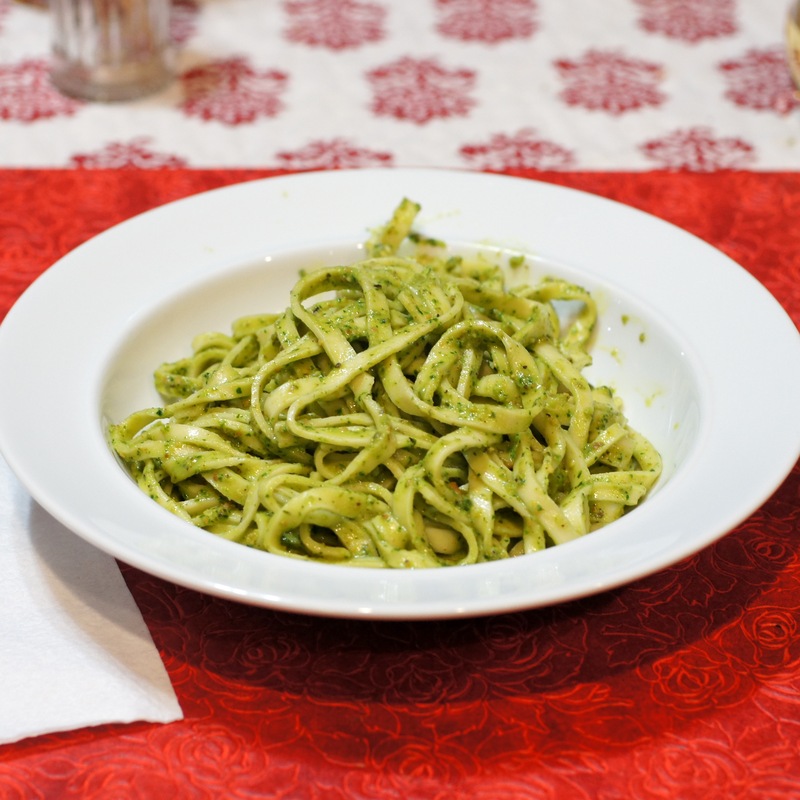 The pistachio pesto was so good, it simply required a nice pasta. Reading your homemade pasta posts and those of Stefan made me want to make it again. There really is nothing like homemade pasta. Previously, I have made it with either 100% all purpose flour or 100% semolina flour. I had never tried a combination of the two. I really liked it this way because you get the slight chewiness of the semolina with the smooth tenderness of the all purpose flour. If you try the combination, let me know what you think. Homemade pasta!!! LOVE it, Richard!!! Hi, Alice. Thanks for the nice compliment. This was fun and we will definitely do it again. I’ve got semolina flour (2 bags) just waiting to be pressed out into glorious sheets of pasta.. but I’ve been too nervous to try (just ask Chgo John!). My friend spree (cooking-spree) making his ravioli and now here is a lovely dish laden with pistachio pesto I’m anxious to try. I wonder where/how/if you dry your pasta once it comes out of the pasta cutter? (I bought the cutter about 4 years ago and it’s still in the box.. shhhh). Nice to see that you’re making fresh pasta. Thanks for the mention 🙂 50% semolina is a good allround mix. I have pasta making on my kitchen wishlist. I cannot believe you cut that by hand. So neatly! You don’t need a machine. I’m impressed. 🙂 I have no excuses now that I don’t have a machine. Only a smiling visitor here to share the love, btw great layout. Thank you for visiting us and the kind words. Hope you will stop by again.